OK, the name is pronounced cram-zee, it was my deceased brothers’ nickname and I stole it! Since 1991, we have been involved in multiple facets of the Parking Controls, Security, Access Control and RFID industries. We have developed and nurtured a strong customer service reputation with systems integrators all over No. America and are committed to providing that same service and solution-based approach toward earning your business. Sales offices in Atlanta, GA, Salt Lake City, UT and Sacramento, CA. 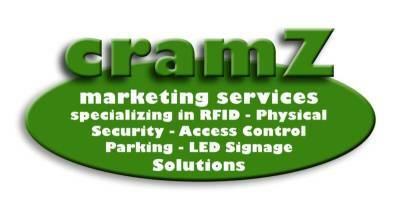 Schedule a webinar with us to find out how cramZ marketing services, Inc. can find the right solutions to your Parking Guidance and vehicular access control challenges. You have, no doubt, heard that we are representing the exciting new app from Focus Engineering ... FoPark? PureTech Systems® is an industry leader in Video Analytics technology that we have partnered with to offer a Camera Based, Video Analytics platform to provide highly accurate Vehicle Counting and “state of the art” Parking Guidance for Global and Level count applications. The PureActiv® software integrates with our PIMSTM software to provide not only the most accurate count data available, but opens up the Parking Guidance System capabilities that todays’ busy Parking Managers/Operators and End Users need to make quick, intuitive decisions. Parking Intel & Management System (PIMS) is a robust software package that interfaces with the PureActiv video analytics software to provide users with real time Parking Guidance, Space Availability and Vehicle Count statistics. PIMS provides operators and administrators with multiple GUI (graphical user interface) options, user definable reporting and data export capabilities, LED sign control and email alerting features. 3millID - Simplify gate and door access with multi technology readers that incorporate bluetooth, proximity, and smart card technologies. Bluetooth enables you to eliminate the need for badges, tags and stickers by utilizing virtual credentials that are downloaded to a smartphone and transmitted to our Readers via encrypted Bluetooth. Issuing of credentials is now as easy as sending an email to the user, and you can cancel and reissue the same credentials as many times as necessary. RFWireless - Wireless Data Transmission using 900 MHz radios - Wiegand and Serial (RS232, 422, 485) version radios available. We have eliminated the high costs associated with trenching and wire/conduit runs for either Wiegand gate/door controls or LED sign controls. The Wiegand version is available in One or Two Gate/Door control kits and the Serial Radios are “self healing” MESH network radios. Both radios utilize advanced AES 256 bit encryption and are FIPS197. The radios are FHSS (Frequency Hopping, Spread Spectrum) resulting in no interference and FCC Part15 certification means no site licenses are required. RFID HangTags – We offer custom graphics on a high quality UV stabilized proximity hangtag. For the millions of customers that use either HID or AWID proximity Readers for gated entrances, we combine the visual verification aspect of custom, color coded hangtags with the marketing presence afforded by the use of customer logos (if desired) and the low cost advantages of proximity technology. Order fulfillment for custom tags in the fastest in the industry and we can also include barcodes if desired. Quantities as low as 250 units!